Parents and students were already browsing the art on display in the Dixon Library before the doors officially opened at 6pm. From then until 7:30, the Library was almost consistently packed with people admiring Dixon students’ hard work in their art classes throughout the year. 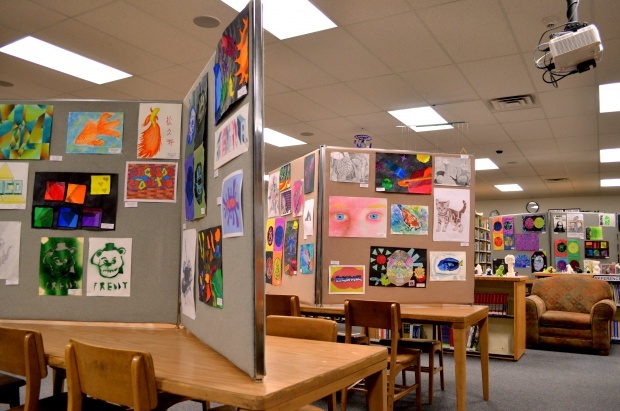 The Art Show on display in the Library. 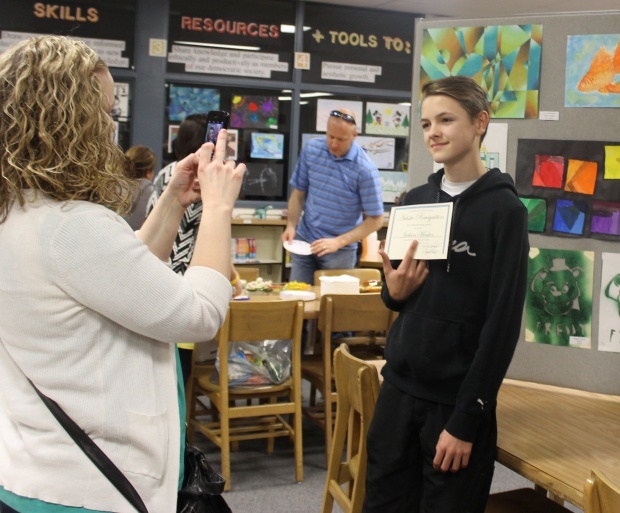 The artwork was on display this entire week (May 2-6) but the Open House was at the beginning of the week, on Monday, and invited parents and community members to come and browse as they enjoyed refreshments. Students featured in the show could pick up a certificate that stated their participation. Jackson Moulton with his certificate in front of a piece of his artwork. Ms. Cellar and Mr. Harris, Dixon’s art teachers, use the Art Show as an opportunity to showcase exemplary student work. They keep artwork throughout the year in anticipation of displaying it in the show. 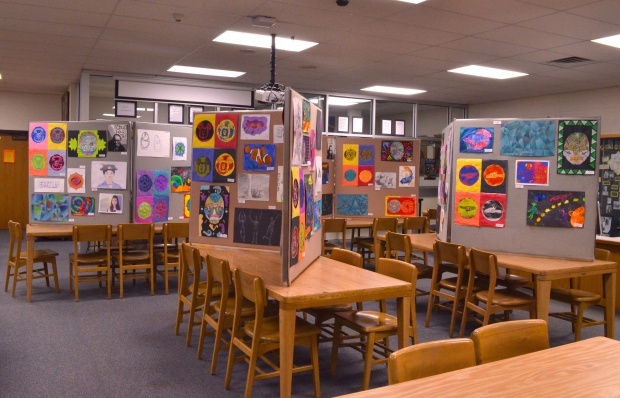 It is currently impossible to represent every student in the show, though they try their best to display every students’ work in the hallways throughout the year. 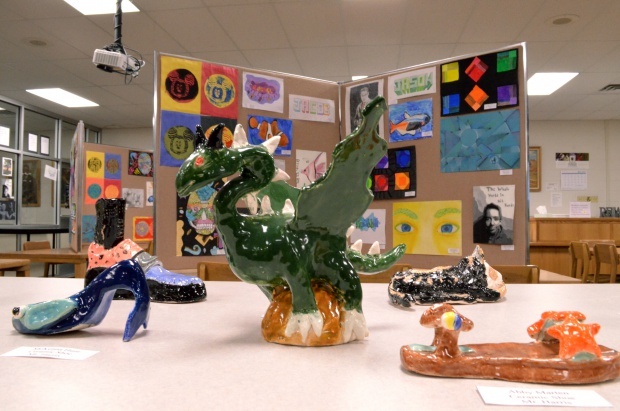 Juan Medina’s clay dragon soars among other clay projects. Ms. Cellar teaches Photography and Art Honors, while Mr. Harris teaches CAD (Computer Aided Drawing) and Art 2. Both teach Art 1, the mandatory art class all 7th graders take at Dixon. Work in the art show ranged from 2D drawings of still life and grid drawings to Sugar Skulls (from the Mexican holiday Day of the Dead), paintings displaying use of watercolor and color theory, and 3D pieces such as clay sculptures and abstract mobiles. 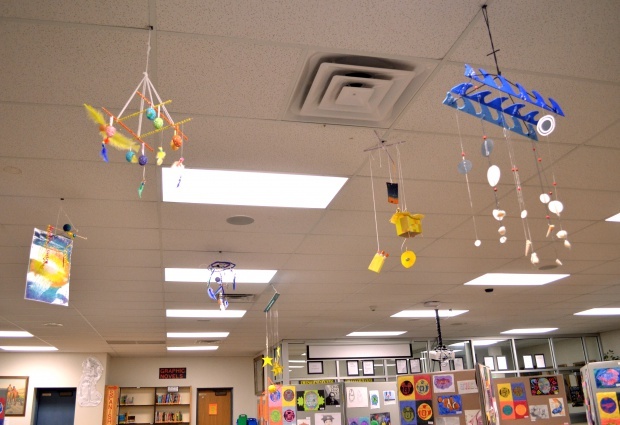 These mobiles each represent a different song using only shapes and colors. Inside the Library’s Presentation Room, video work from Ms. Cellar’s Photography class and Mrs. Moody’s Digital Media and English Honors classes were being played. You can find the whole video here! 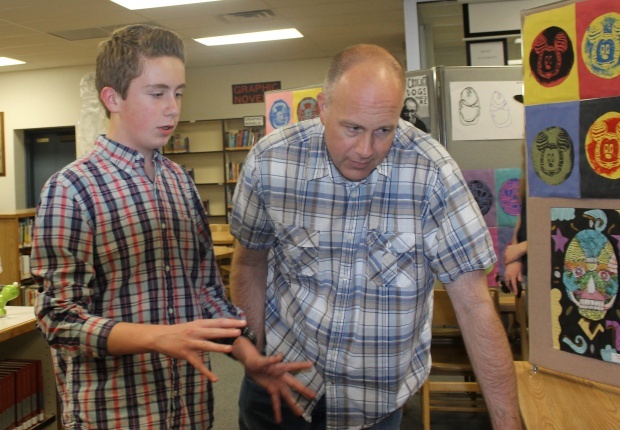 The reaction from parents and other faculty was overwhelmingly positive at the display of students’ talent. This is the third year the Art Show has happened, and this was by far the most people that have attended the Open House in those three years. One of Dixon’s students explaining the artwork to his father. After the display comes down, Ms. Cellar and Mr. Harris hope to get permission to keep enough works to display in the permanent collection, which is currently displayed in the art hallway. It is their goal to ultimately use the permanent art collection to decorate more hallways in the school.